The worlds of Unbreakable and Split collide in Glass. Glass, Shyamalan’s latest film, hits theaters this week; it’s an endcap to a subtle superhero trilogy sometimes referred to as “Eastrail 177 Trilogy,” after the train wreck that started it all. And while watching (or rewatching) the earlier movies is the best way to get caught up, not everyone has that kind of time. So, here we’ll go through the pertinent plot points and details so you can understand Glass to the fullest. There are no spoilers for Glass here, but lots of spoilers for the other two movies. Elijah Price (Samuel L. Jackson) and David Dunn (Bruce Willis) in Unbreakable. In Unbreakable, Bruce Willis plays David Dunn, a man with a rocky marriage and young son, who ends up being the lone survivor when Eastrail train 177 derails outside Philadelphia. The fact that he’s the only survivor and actually wasn’t even injured catches the attention of Elijah Price (Samuel L. Jackson), an art dealer specializing in comic books (more on him in a bit). Elijah tracks down David and tells him and his son Joseph (Spencer Treat Clark) about a theory. Elijah’s theory is that comic books are kind of like modern hieroglyphics, in that they tell exaggerated versions of history. He believes superheroes exist, just maybe in a less obvious way than in the comics, and that David could be one of them. He asks David to think if he’s ever been hurt or sick before. Though David is skeptical, Joseph instantly believes Elijah and tricks his father into lifting a superhuman amount of weight. However, David is still unconvinced. That begins to change when David realizes he has the ability to touch people and see if they have committed evil acts. He tests this at work—he’s a security guard at a football stadium—and realizes he can sense that a man (played by Shyamalan) is selling drugs in the stadium. David still isn’t totally convinced though, especially when remembers he was actually sick as a young boy. He almost drowned in a pool at school. David tells Elijah about this, but Elijah explains that all heroes have a weakness and David’s is probably water. Now, mostly convinced that Elijah is right, David sets out into the evening, wearing his security raincoat to try and do some good. He finds a man who has kidnapped and tortured a family, follows him back to their house, fights and defeats the man, and saves two children in the process. The heroics make the local newspaper the next day. Joseph tricks David into lifting way more than he thought he could. It’s in this moment, when the newspaper writes about a mysterious hooded hero, that David reveals to Joseph he is what his son believed, a superhero. However, David asks Joseph not to tell Audrey (Robin Wright), David’s wife, because their once-rocky relationship is finally getting back on track. Excited that Elijah was actually correct, David goes to tell him at Elijah’s gala art opening. There, David meets Elijah’s proud, supportive mother, played by Charlayne Woodard, who helped get him into comics in the first place. Elijah asks David to shake his hand as a truce and David’s power kicks in. He realizes it was Elijah who derailed the train he was on. In fact, Elijah has been committing mass murders all over Philadelphia to try and find a lone survivor like David. But why? The film ends with text revealing David turned in Elijah who was sent to a mental institution. James McAvoy as Patricia, one of Kevin’s personalities in Split. Unbreakable takes place roughly in the year it was released, 2000. Seventeen years (and many unrelated movies) later, Shyamalan released another movie called Split. It was marketed as a simple thriller about a man with several personalities, played by James McAvoy, who kidnaps three girls. And that’s what it is...for the most part. Patricia is basically a prim, proper, older woman. She’s confident, smart, and cunning. She and Dennis had been suppressed for a long time because they believed in the Beast, but recently have taken over the light to bring him out. Dennis, one of the leaders of the Horde along with Patricia, is a stoic, strong, middle age man with obsessive-compulsive disorder. He hates when things are not clean. He also is a pervert who likes to kidnap young girls and make them dance for him. Hedwig is a nine-year-old boy. He’s loud, curious, and loves to dance (especially to Kanye West), but is easily manipulated. He also has the unique ability to steal the light from anyone, which Patricia and Dennis use to take control from the others. Anya Taylor-Joy is Casey, who escapes the Beast in Split. Dennis is the personality who kidnaps the three girls; over the course of the film, two of the girls die. The one that doesn’t is Casey (Anya Taylor-Joy). She’s the smartest of the bunch, making friends with Hedwig, and actually unearths the real Kevin by saying his full name out loud when she tries to escape. As she’s making that attempt though, the Beast finally manifests itself and comes after her. He climbs up the walls unnaturally, bends steel, and survives two point-blank shotgun blasts. However, he eventually lets Casey go. That’s because we find out Casey was abused like Kevin. Her uncle would abuse her, especially after her father died, and Casey’s body is scarred because of it. The Beast sees the scars, knows Casey has suffered and spares her because he deems her worthy. After escaping, the Horde basks in its victory. The Beast is superhuman. He can’t be injured easily, is extremely powerful, and may just be what the others said, the next step in human evolution. And now, he wants to cleanse the world of people who haven’t suffered as he has. Cut to a diner. The news is reporting about the Horde, who escaped after kidnapping the girls, and someone in the diner says that this reminds her of a guy from a few years ago. A man who killed a bunch of people who was also given a funny nickname. It’s then revealed that she’s sitting next to David Dunn, who says that name was “Mr. 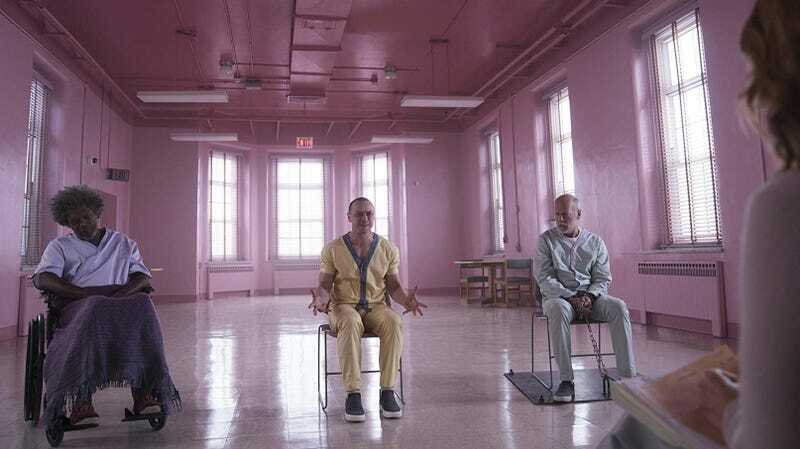 Glass.” And, for the first time, we realized Split takes place in the same world as Unbreakable, and David Dunn has a new villain to take down. It’s here that Glass begins. We’ll have more on that soon.